Have you ever heard the saying, “When angels are near, feathers appear”? Finding a feather is often a miraculous moment for me. I seem to find feathers in the most unusual places. I have found them on my front door step when I arrived home, in the parking garage next to my car leaving work, a pink feather in the passenger seat of my car, and on the front steps of my office building in downtown Raleigh. Angel feathers seem to always show up out of nowhere, at the oddest times and in the strangest places. It is because they show up in the most bizarre places, they are meant to be seen! And when they appear, they give me that glimmer of hope to not lose faith and never give up in whatever challenges I may be facing in my life. Most recently, I was telling my boyfriend David about my experiences with angel feathers. I stated it had been a while since I found one. I looked up at the sky at that moment and said, “I would like to find another feather”! Later that day, David and his two children, Jacob and Josie, gave me a tour of their twelve acre woodland property. After a long nature walk through the forest, we approached the entrance to his property. His cat Star was laying in the grass as if she was waiting for our return. RELATED: The Sin Of Being Psychic: Spiritual Insights From A Psychic Christian. As I walked closer to greet Star, I notice a large black and white hawk feather sitting beside her. My heart dropped into my stomach and I quickly ran to pick up the feather. I turned around with a big smile on my face and said to David, “Ask and ye shall receive.” I quickly glanced up to the heavens through the trees and said, “Thank you God!” My heart was overwhelmed with excitement. Not only was it confirmation for me, but also proved to David that I wasn’t crazy, even though he was a little freaked out. He had never witnessed a divine intervention like that. I think he’s a believer now and his children are on the look out for angel feathers too! On a weekend camping trip to Jordan Lake, Josie found an angel feather of her own to share! On our way home from the lake, Josie’s feather flew out the driver side window of the truck. For a brief moment, I was so disappointed and told David that I guess the feather was meant to stay at the lake. It was then that Jacob asked, “Why is there a feather in my lap?” Somehow the angel feather floated back into the truck and landed in Jacob’s lap in the backseat! Magical moments! Angel feather found on David’s property and Josie’s little angel feather found at Jordan Lake. I’ve had two rare occasions where I believe I have actually seen an angel appear before me. They did not look like the renaissance paintings that show them dressed in robes with large wings behind them. I can see why historically they have been presented that way in architecture, books and paintings. To me, these celestial beings appeared as beings of light. Their light is so luminous, an orb radiates around them that gives our human eyes the optical illusion they have wings. The light that radiates around them is not really white, but a golden color, almost like the color of the sun, but far more vibrant. And angels are very high in stature. The two angels that I believe I saw were between seven and eight feet tall. I don’t believe angels need wings to fly. I think that because they have been represented with wings in paintings and sculptures for thousands of years, they show themselves to others as if they do have wings so that we will recognize them. Feathers are very important symbols in other cultures. 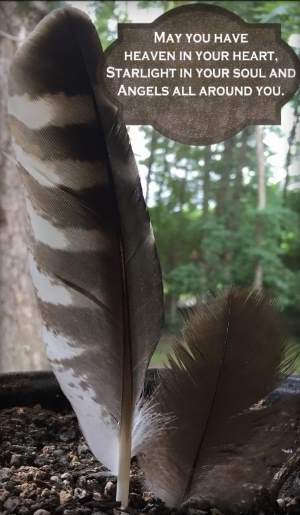 Native Americans wear feathers to represent their communication with the spirit world and feathers symbolize trust, honor, strength, freedom and wisdom. Native Americans believe that finding a feather means you were hand picked out of the rest of tribe and you have been given a special gift from the highest official. The bible makes many references to feathers and symbolizes protection and love. Many verses reference wings and feathers as a place of refuge to take cover and as a shield of God’s eternal love. Sometimes I doubt myself and have trouble deciphering my own intuition when struggling with major life decisions. And when angel feathers appear, they are a big “YES” for me as an answer to my prayers. They also appear during times of hardship and struggle. When they appear, they remind me to pay attention and usually materialize when major changes are happening in my life. They also occur when I’m worried about something and prompt me to remember that we all must go through the storm to find our rainbow. Feathers symbolize that everything will work out for the best even though you can’t see the light at the end of the tunnel. They are a shimmer of hope that uplifts a heavy heart when things seem hopeless. Over the years, I have come to believe that even though we can not see their presence, Angels can make themselves known by giving us signs that they are near and always around. For me, their sign is feathers, and I love birds too! So the connection between birds and angels is very meaningful for me. Feathers for me represent looking at things from a higher perspective and moving beyond the boundaries of the physical world we live in. We tend to get caught up in everyday life and struggles that we forget about the spiritual realm that resides here with us. Angel feathers represent flight and freedom and remind me to pay attention to everything that happens around me. They are a divine sign that we are never alone and give me the affirmation that I am going in the right direction. If you find a feather along your path, don’t ignore it! Pick it up and simply say, “thank you” for you have been given a heavenly gift. Allow them to remind yourself that your angels are with you and always around you.